Americans are generous with their pocketbooks, but trying to make a difference and actually making a difference are two different things. Where Am I Giving? by New York Times bestselling author Kelsey Timmerman takes you on a journey to meet people who will inspire you to live a purpose-filled, generous life and make the greatest impact you can through your career, time, consumer dollars, and donations. 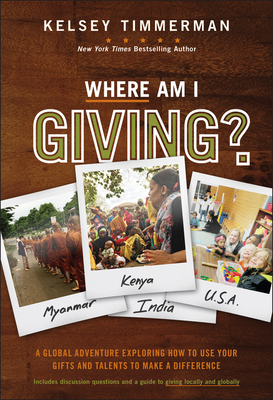 Starting in his hometown of Muncie, Indiana, and then traveling all over the world (Myanmar, Kenya, India, Nepal, and more), Kelsey explores not only different ways of giving--as a worker, consumer, volunteer, giver, local and global citizen--but also the benefits and effectiveness of these methods. He spends time with monks, students, a refugee, a Marine, a former Hollywood executive, Peace Corps Volunteers, and seasoned aid workers to explore how they give, as well as with the people on the receiving end of their giving. Along the way he struggles to be a more informed giver as he becomes a "voluntourist," starts his own local non-profit, and searches for a balance between rationality and passion in how he gives. Examine types of giving, including microlending, volunteering, donating, ethical consumption, mission trips, voluntourism, child sponsorship, etc. Where Am I Giving? is a fast-paced narrative combining compelling stories collected over 15 years of travel to 90+ countries, mixed with practical advice on how to make giving a part of our everyday lives.